Nobu Residences is a new spectacular mixed-use condominium community development - a unique integration of live-work-learn-shop-play currently in pre-construction with hotel and retail uses located by King St W & John Street in downtown Toronto's vibrant Entertainment District by Madison Homes and designed by Teeple Architects Inc. 2 Condominium Towers rising 49 storeys high with 700 units and retail space on the ground floor are set to transform the face of this fast-changing location, an iconic landmark on the downtown skyline. The project will start selling March/April 2017 and prices will start in the Mid $200,000's. Nobu Residences two soaring towers will be complemented by fantastic retail options and famous restaurants at the podium. These 2 dramatic high-rises are located on 15 Mercer St, Toronto, ON M5V 1H2 which is a proposed mixed-use structures consisting of two pillars of 49 storeys in height (191 metres including mechanical penthouse) and might be with a "multiple storey link at the top" connecting the two (a recent proposal was just submitted in 2016 to be desinged without the skybridge). 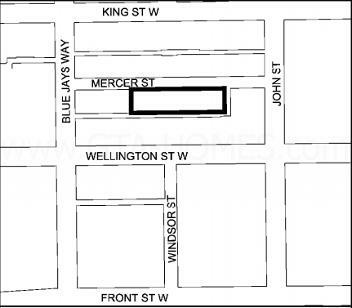 There will be a proposed 8 storey base (37.6 metres in height) which will include the façades of the designated heritage site located at 15-33 Mercer Street and "to retain the interior of the lobby of the Pilkington Glass building at 31 Mercer Street". The façades are proposed to be integrated into the podium. A two level 15,000 square foot restaurant is proposed which will include a bar lounge, outdoor lounge with stylish high-class exclusive dining rooms and is the world's most recognized Japanese fusion cuisine "Nobu Restaurants" known for its innovative new style cuisine paired with a hip crowd and celebrity following. Currently this chain has 22 locations worldwide, many in the US, Asia-Pacific, Mexico & Caribbean, Middle East & Africa, Europe and of course soon to be in Canada. 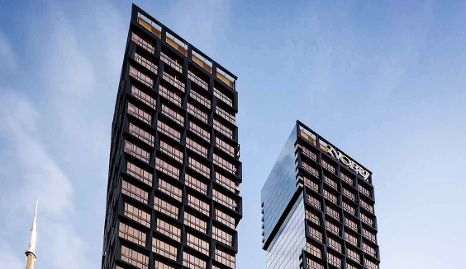 The proposed project will also come equipped with meeting rooms, a commercial fitness area and a 163 room hotel with conference and banquet facilities located above the top 5 floors of the west tower. On top of that will be the 884 condominium residential suites of which 634 will be one-bedroom units, 157 will be two-bedroom units and 93 will be three-bedroom units. 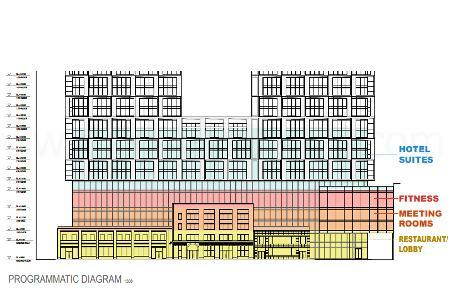 Total gross floor area is 80,394.2 square metres of which 67,265 square metres is residential use space, 547 square metres is retail use space and 12,582.2 square metres is for institutional/other use space. The former proposal in 2011 was for a 49 storey building with 567 units. These 2 luxury high rise towers is in the heart of the Entertainment District Toronto will have 4 levels of proposed underground parking for 216 vehicle parking spots located in parking stackers designed to hold two cars per stacker. There are also 885 proposed bicycle parking spaces and there are 5 loading docks on site. There are also a total of 1,768 square metres of indoor amenity space proposed and 594 square metres of outdoor amenity space proposed. New information shows that Madison Homes is preparing to propose 2 49 storey towers instead of the 57 storey and 67 storey O-shaped building in the last proposal. The new proposal has decreased condominium suites from 1086 to 884. Parking has increased to 6 levels of underground parking instead of 4 for 338 parking spaces instead of the previous 216. The ground floor will hold the hotel lobby, the residential lobbies, a café and of course the most famous restaurant in the world. The façades of the existing three buildings will be maintained on the site. There will still be more consultations and the proposal still could change before it is presented to the city and more changes may still result after the application is in. 2 sleek condominiums located in downtown core in the Entertainment District. This area is home to world class performing arts centres, theatres and many family attractions. Toronto's major-league sports teams can be found here and events such as TIFF that takes place here. This area is also home to the Canadian Opera Company, the Toronto Symphony Orchestra and the National Ballet of Canada. This is also where you can find a selection of fast-food places, bars and nightclubs to choose from. This luxurious development is situated near theatres such as the Princess of Wales Theatre, the Roy Thomson Hall, the Royal Alexandra Theatre and the Four Seasons Centre for the Performing Arts. 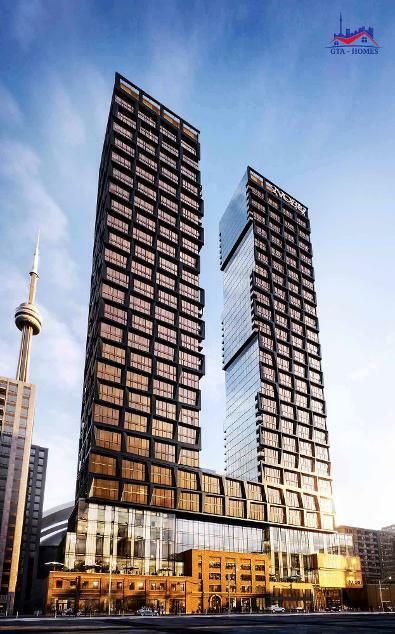 Other attractions that you can find near the Nobu Residences is the Rogers Centre, Ripley's Aquarium of Canada, Harbourfront Centre, the Art Gallery of Ontario, the CN Tower, the Metro Toronto Convention Centre, the Air Canada Centre and much much more. 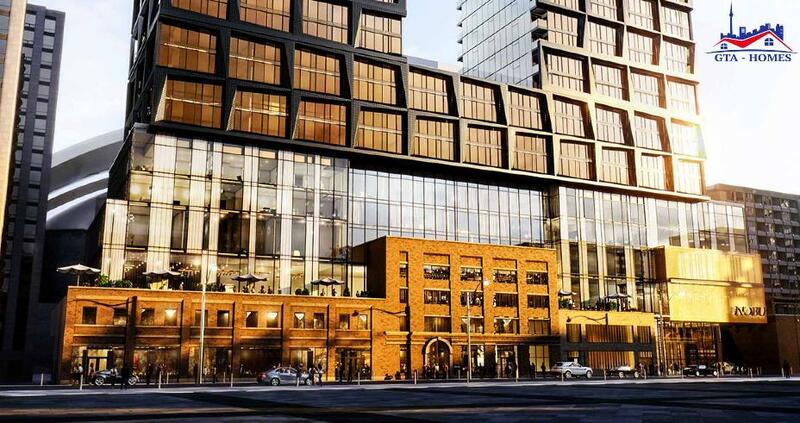 This sleek high-rise structure is also located where public transportation is easily accessible with St. Andrew Station situated nearby and is also not too far from Union Station Rail. The Gardiner Expressway is situated south of the site and Ryerson University, OCAD University and the University of Toronto is located not too far away. This condo project is where you can live, work and play. Please register with us today and to be first to receive Brochure, Floor Plans & Price List. Launching April 2017! Madison Homes is an award-winning family-run and Toronto-based real estate developer with over 40 years of experience building quality homes throughout the GTA including condominiums and commercial (office/industrial/retail) buildings. Madison Homes has won many marketing, sales and design awards in Canada and the United States one of which is the Project of the Year by the Ontario Home Builders Association. They have been "setting the standard for value, design and customer satisfaction". What makes Madison Homes a success story is that their homes are constructed with the customer's needs and wants in mind and with having due care in their construction process that results in quality built homes that lasts the test of time. They are involved in every development process from land acquisition to home design, to construction build and leading to exceptional customer experiences. Madison Homes has built thousands of homes to date located in desirable neighbourhoods that have easy access to public transportation and/or highways for residents to conveniently get around the GTA when needed. Teeple Architects Inc. is an award-winning architectural firm that was founded in 1989 and has established a reputation for having "innovative design and exceptional service". Their portfolio includes projects such as residential, institutional, university buildings, commercial, schools, recreation centres and so on. They design projects of "exceptional materials and quality". Together, Madison Homes and Teeple Architects have collaborated to design and build Nobu Residences coming soon to the Entertainment District . For more than 20 years now, the people here, at this world's most celebrated luxury hospitality brands have traveled the world which has in turn inﬂuenced their lives and careers as artists and restaurateurs. The success drawn from these travels, inspired to create unique and dynamic inspired restaurant experiences around the globe. The HollyWood Star Power effect has built a strong following of intriguing international customers, celebrities, tastemakers and powerbrokers. The vision goes beyond the boundaries of the Hotels and Residences that are built on the same key principles encompassing the unique blend and perfect harmony of luxury, fun, and happiness. The hotels offer a sensual, sultry, fusion of laid-back luxury, high-energy nightlife, exclusive guest room retreats and spa services. It is the ultimate playground for our international client base and will be like no other. It creates powerful stages for shared experiences of excitement and escapism. Featuring the best of everything with imaginative new restaurants, high-energy bars, relaxing rejuvenation, distinctive service, and an air of celebrity. Founding chef of this famous eatery is Chef Nobu currently oversees the global portfolio of all the diners. Struan McKenzie -Chief Operating Officer. McKenzie’s strong expertise covers all aspects of hospitality from development, operations, strategic marketing and financial from boutique to chain. Meir Teper. Hollywood film producer Teper, in conjunction with De Niro, convinced the Chef to open the first restaurant and an influence in expanding the famous saloon to the world. Robert De Niro. Highly acclaimed actor, director, producer and two-time Academy Award winner, De Niro was a strong force in bringing the artistry of this famous restaurant first to New York and then to the the world. Trevor Horwell -Chief Executive. Visionary of the hotel business, marketing and development, Horwell has been instrumental in evolving the luxury lifestyle hotel and residential concept throughout North America, Europe and Asia.